I love the bones of this space, and relish the thought of actually having a bedroom with such a dramatic 'headboard' such as the one shown here. I do think though that this arch isn't being used in the best manner - there's so much more that could be done to really enhance it. Add wallpaper or stencils or decals perhaps, or install impressive lighting, or simply add paint. 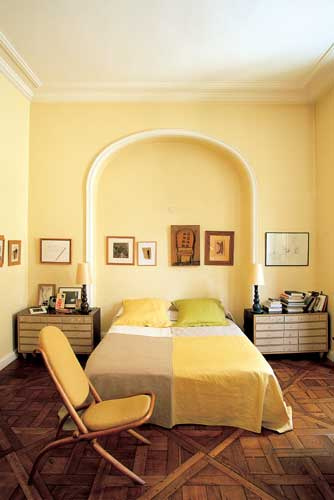 What would you do to give this arch the respect and attention that it deserves? Or do you prefer it 'as is'?